First of all, let’s get something straight. The New York City ban on the sale of sodas larger than 16 ounces, at face value, was absolutely ridiculous. 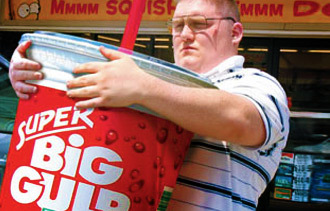 The act of banning people from purchasing a giant sugary beverage is just plain foolish….laughable in fact. But when you examine things from a different angle, I believe this was a brilliant move by Mayor Bloomberg. Allow me to explain why…. People against the soda ban argued that it was an affront to their civil liberties, which makes perfect sense and is impossible to refute. After all, drinking a huge soda is not hurting anyone other than the person consuming it….so why should that be a crime? However, why is not wearing a seatbelt while driving a vehicle a punishable offense? And what about not wearing a helmet while on a motorcycle? These infractions have nothing to do with the health and safety of others….and everything to do with protecting you as an individual. These laws are setup so that if/when you get into a crash on the road, you might stand a decent chance of survival. In other words, these laws are designed to avoid putting yourself in harm’s way and minimize the threat that you may injure yourself. So tell me….what difference exists between the following two scenarios?? – When you lay your motor bike down on the road, no one wants to sweep up the remains of your skull from the asphalt. In other words, you are going to kill yourself, bozo! – When you guzzle endless amounts of fizzy sugar-water, no one wants to lop off your leg because you have diabetes. In other words, you are going to kill yourself, bozo! I’m not seeing too much of a difference, personally. So limiting the intake of soda wasn’t so much about taking away personal freedom – because, we all know DAMN WELL that people got around it anyway (i.e. buying two sodas) – it was more about SENDING A MESSAGE. A message that said “You seriously ought to think twice about doing what you are doing.” And I don’t think that is ever a BAD message to convey. Anytime you increase people’s awareness, particularly around health and longevity, I consider it to be a good thing. Consider all of the anti-smoking ads we currently see on television. People who smoke are making a very well-informed decision. Why not do the same with something like soda, when the repercussions are equally as serious? So while I think the ban was foolish at face value and very likely unenforceable in the first place, I belive the message that it sent had merit and I admire Mayor Bloomberg for taking this action.